In a paper published in NANO, a researcher from the Department of Chemistry at Myongji University has applied a novel method to control the wettability of polymeric substrates, which has numerous practical implications. How can nano-sized polymer thin films with controlled wettability be prepared in an environmentally friendly method? Researcher Dong Kee Yi has discovered a method of controlling surface wettability of wavy patterned two-dimensional poly(dimethylsiloxane) (PDMS) films by combining colloidal self-assembly and controlled strained-releasing. This innovative strategy has demonstrated that the surface wettability of wavy patterned polymer thin films was tuned by the details of the grooved geometries on the surface of the films. The wavy PDMS films exhibited time-dependent reversible wettability, which was understood to be the result of the reversible surface chemistry of PDMS. The buckling nature of the pre-strained polymers was further applied to the fabrication of second layer of wavy polymers, which showed surface hydrophobicity on different geometries. 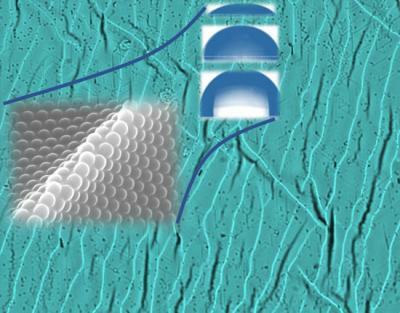 Controlling the wettability of polymeric substrates is of great importance in the development of flexible, highly functional materials with applications in the arraying and ordering of biological cells, the formation of hydrophobic nano-films for wearable devices, the preparation of regenerative cell scaffolds, water repellent fabrics, and for self-cleaning adhesives. "This approach can be applied in various nano-size polymer thin film fabrication with controlled surface hydrophobicity, while avoiding any potential toxic chemical treatment," commented author of the report, Dr Yi. This research was supported by the Korean NRF, Korea Institute of Energy Technology Evaluation and Planning (KETEP) and Ministry of Trade, Industry and Energy (MOTIE) of the Republic of Korea. The corresponding author of this study is Dong Kee Yi ([email protected]). Caption: The buckling nature of pre-strained PDMS was applied to the investigation of the dependency of surface hydrophobicity on different geometries of wavy polystyrene thin films, which were fabricated using colloidal self assembly. This approach can be further applied for fabricating various polymeric nano-films with controlled hydrophobicity.